Do you want a fitness class in Manchester that inspires you, energizes you, gives you a full body workout in a party environment? Well, you’ve got it: Welcome to Zumba! The weather is often not good, so Manchester exercise inside at a party! The La Suerte Dance School Zumba workout combines high-energy dance moves with more traditional exercises. Throughout the routine, moves are performed to upbeat music selections, including merengue, salsa, reggaeton, bachata and hip-hop. The tempo alternates between slow and fast; classes begin with a warm-up session and finish with a cool-down period. Every session of Zumba makes you burn 500 – 800 calories without feeling that you worked out. In Zumba, your mind is at class - you are concentrating on the steps, having fun and moving to the music. Zumba is an exercise in disguise. It is not like going to the boring gym – doing reps and sets; therefore people stick to it and that’s why it is effective. To gain the most benefits from a Zumba workout, keep your entire body moving at all times by shaking body parts, moving laterally and engaging your arms. Zumba is fun to perform and can lift your spirits while helping you get in shape. The positive group dynamic can encourage you to stick with the program. Zumba is a happy drug. Zumba is an electrifying joy. You forget everything – especially stress from your daily life. Zumba improves your mental health and improves your physical image which in turns helps you feel better - a Zumba High! In La Suerte’s Zumba Classes, we like to use our Dance experience in generating our Zumba classes. We mix easy Latin dance moves with traditional aerobic exercises to top Latin songs. 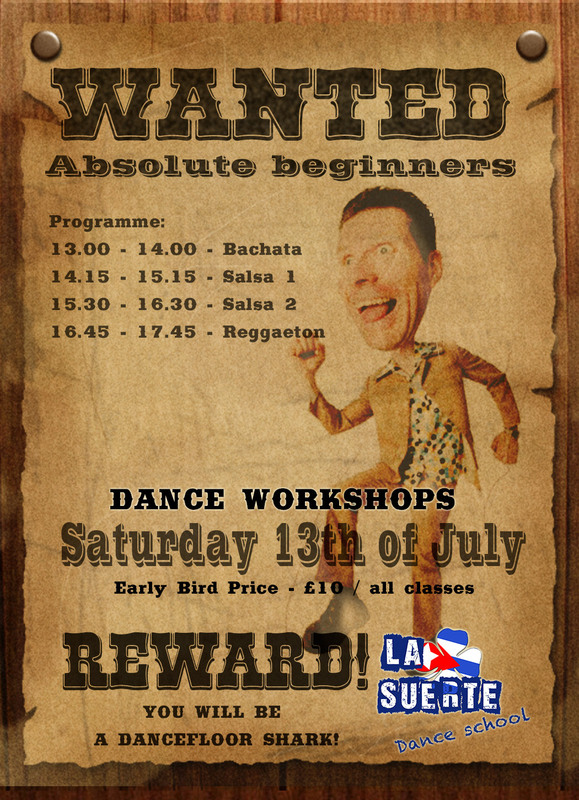 Come along to La Suerte Dance School and give Zumba a go Manchester. 22.15 - till late - Cuban salsa, timba, bachata, kizomba, cha cha - new wooden dance floor, a lot of space to dance. You can bring your own %drinks%, food and friends! Invite your friends if they are dancers or not. There will be enough room for everybody. Free car park available in front of the venue. - There will be bachata classes on Friday before the party as usual. They are not a part of OPEN DAYS. - The new beginners salsa course will start on Monday 22nd of September 7pm. Classes twice a week - every Monday and Friday 7pm. - new class coming soon! Salsa show-style! La Suerte is closed because of Festival Cubano. We will reopen on Tuesday 6th of May. La Suerte Open Days 2013 + PARTY! The event everybody was waiting for! LA SUERTE DANCE SCHOOL OPEN DAYS! 21st & 22nd of SEPTEMBER! 21.30 till LATE - PARTY! PARTY! PARTY! During the party: animations, ruedas and a DANCE SHOW! La Suerte Dance School will be closed from Thursday 22nd of August till Tuesday 27th of August. We come back with classes on Wednesday. You have never danced before and would like to try dancing? Those workshops are for you! Small changes to our classes timetable will apply from Monday 24th of June. Kizomba course will stop for summer break from 14th of July. We will come back with kizomba classes in September. New Salsa and Kizomba Classes on Sunday! We are happy to anounce we will be open one evening more at La Suerte. 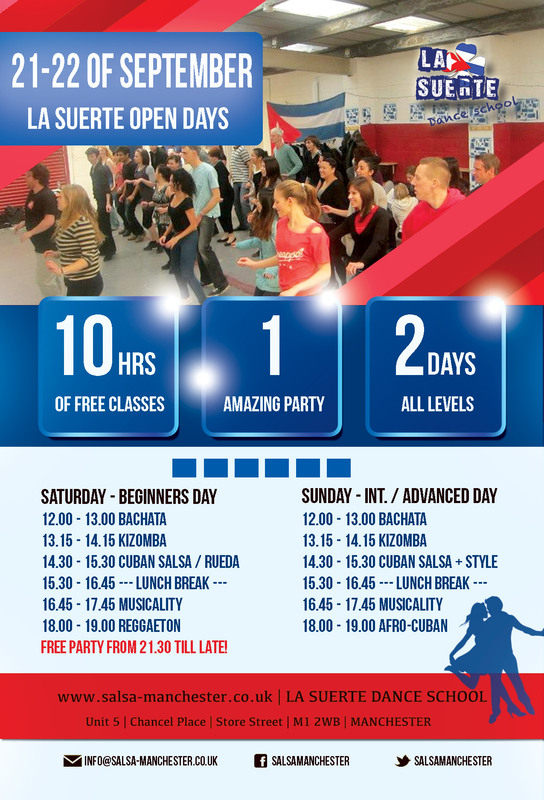 Because of popularity of our Fast Track classes we decided to open new INTENSIVE Cuban Salsa Course.